If that’s the case, then why should we bother with the courts and, indeed, liberal democracy itself? Not that logic has ever been the bottom line to Tory politics -it’s always about position-taking to defend and extend the interests of entrenched privilege. 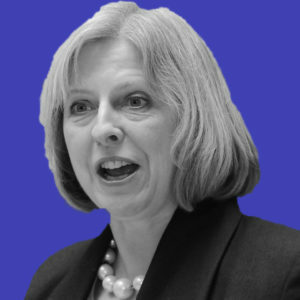 Yet reiterating the pledge to scrap human rights legislation and withdraw from the ECHR (where Britain will join the company of Belarus) is her wink to the Tory grassroots, that the EU stuff is cold pragmatism arrived at on the basis of facts when she really is one with them when it comes to dismantling workers’ protections, and bashing immigrants. If the left have virtue signalling, the right have the malevolent wink. And if that wasn’t enough, she raised the spectre of millions of Albanians and Turks descending upon the Jerusalem we’ve built in these fair islands. The only way to head them off is to take leadership in Europe to stop new member states from being afforded the right to free movement. Immigrant-bashing and dog-whistling. Repugnant politics, but from the standpoint of succeeding Dave quite smart politics. As a known Eurosceptic, she has advanced a credible position for staying in that eschews any whiff of EU-enthusiasm. And she’s got away with the usual idiocy about immigration without appearing overtly racist or xenophobic. Contrast this with Osborne, who has well and truly sunk his chances which, as a Labour Friend of George, I’m very sorry to see. And with Johnson, whose faux bonhomie has slipped (again) with a widely-condemned attack on Barack Obama, and who – as his fellow MPs know – only jumped into the leave camp for entirely opportunist reasons might have scuppered his bid. In contrast with the useless and the loud-mouthed, May cuts an austere, serious figure who knows what the thinning grassroots thinks, and appears competent in her brief. When the time comes and the Tory MPs put their shortlist of two to the membership, don’t be surprised if May is one of them. Posted in: Conservatives, Europe, International, People, Politics, Race/Racism.